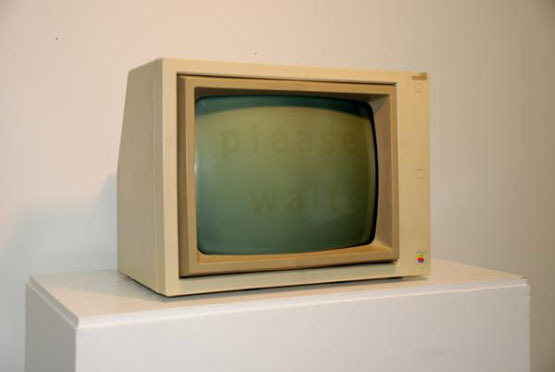 »Screen Burn (please wait)«, 2005. Steven Read wrote a software program in Apple II Integer Basic that displays an image on the monitor’s screen. Then he ran the program continuously for about 6 months. The software image was eventually burned into the screen because the internal phosphor compounds which emit light lost their luminosity and left behind a ghostly trace. The ‘please wait’ text is actually an image which took over 1000 lines of software code to create. The old Apple II operating systems (DOS 3.x, ProDOS, etc.) did not come with any font facilities, if you wanted a font you had to code it from scratch.